So, I have a confession to make. On Friday, I turned (gasp!) 30. I know, right?! Anyway, I went into this birthday feeling more than a little trepidation. There’s something about 30. It just feels like a big milestone. And despite the fact that I have a truly wonderful life, I’ve recently come face to face with the notion that part of growing up means making big decisions, and realizing that each decision closes a door or several. I’ve made some awesome choices–I married my best friend, we live surrounded by our great families and we have strong, loyal friendships, we both have great jobs that give us so many opportunities to grow and have money for more than just the necessities. I am so blessed. But that doesn’t mean that a big milestone birthday like 30 didn’t make me take pause and look back at the choices I let go of, the dreams that I probably won’t accomplish, and the ones I still can. 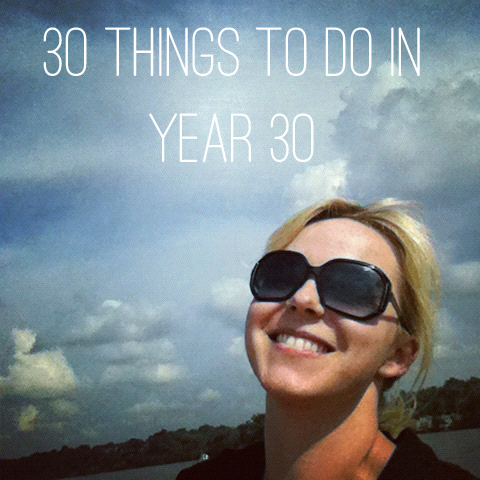 So in the spirit of that, I present my “30 Things To Do In Year 30” list. These are things I don’t want to let another year go by without accomplishing. And I’m sharing it here on Gluten-Free Gluttons because quite a few of them have to do with food, health, and wellness–which means you’ll be hearing more about them! Get into a weekly workout routine—and stick with it! 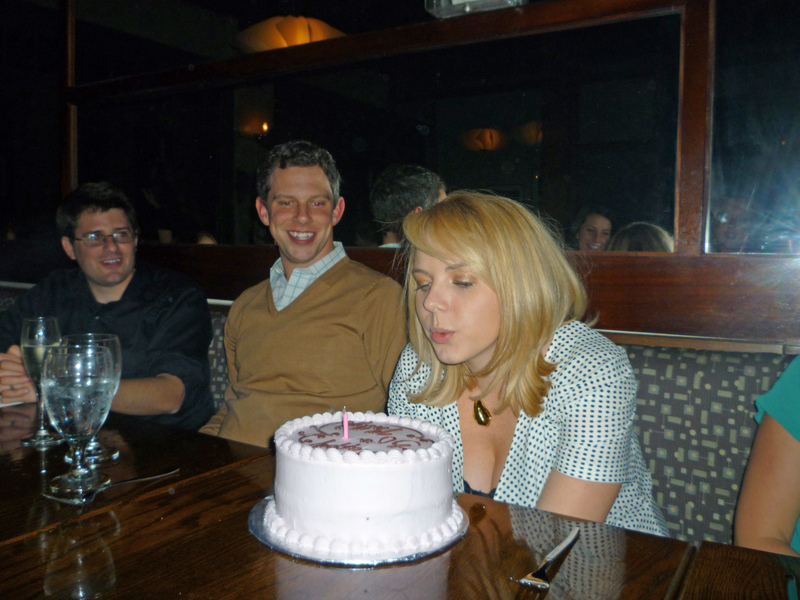 You’ll notice #21 is crossed off, because I did, indeed, celebrate 30 in style. I was showered in great gifts–including some serious bling and 2 dozen orange roses from my husband–my work friends decorated my office and took me out to lunch and brought me (apple-free) gluten-free cookies, and my husband threw me a wonderful birthday party at Eastland Cafe with 15 of my friends. They were very, very accommodating to my allergies. I had their organic arugala salad and Mahi Mahi special. yum. They even let us bring in a beautiful chocolate and raspberry gluten-freecake from Crumb de la Crumb. The party was awesome in every way–and I didn’t feel old at all! Then, on Sunday, I got to celebrate with my parents, sister, and aunt and uncle. My dad grilled chicken brats and my mom made my fav gf cheesy potato casserole and a gf pumpkin cake with cream-cheese icing. I am one lucky 30 year old! 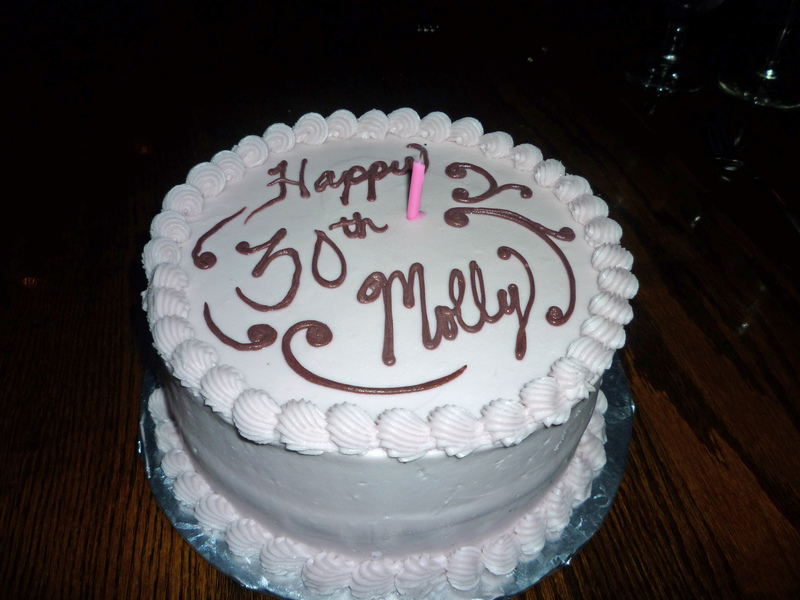 This entry was posted in gluten-free, Healthy, restaurant and tagged 30 before 30, 30th birthday party, birthday, gluten-free, gluten-free birthday, thirty by mollykhodgin. Bookmark the permalink.